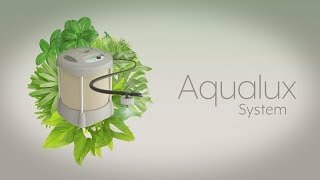 Aqualux System is the new way to water indoor plants, even when you are at work or on holiday, without needing to connect to a tap. The system is very flexible: ready to use in just a few minutes, it has a flexible tank that holds 30 litres of water, and an integrated electric pump which activates a system of fixed drippers, to water up to 20 pots evenly. Simply turn the dial and choose one of the four watering programmes, displayed on the backlit LCD screen. It may be powered electrically by a USB adaptor or using two rechargeable AA batteries. Water distributor with integrated timer and pump to create a drip irrigation system for up to 20 pots. Suitable for house plants as well as for terraces and balconies. The system can be powered electrically by a USB adaptor (included), or 2 rechargeable AA 1.2V NiMH batteries, min. 2000 mAh (not supplied). Foldable water tank in thick PVC, 30-litre capacity. Handy opening at the top for filling. No tools required to assemble the upright supports. Four different programmes (7, 14, 21, 28 days of autonomy), selected with a simple dial. Start button to start the programme immediately or with a delay of up to 23 hours. The backlit LCD display shows the selected programme, the duration of the watering cycle in progress, any programmed delay and the time remaining until the next irrigation cycle. Supplied with 20 metres of PVC feeding hose, 20 drippers, 20 hose stakes, 6 tees and 6 end-of-line plugs. Pieces per pallet: 24 pcs.